Are you a homeowner or kitchen remodeling contractor looking for a luxury range hood ventilation system custom built to your unique specifications or style requirements? Do the stock options provided by Vent-A-Hood not meet your needs? 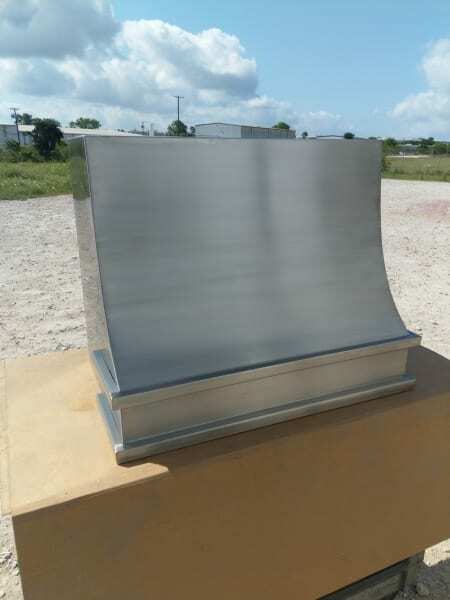 TinKnockers Sheet Metal Company, LLC can design, fabricate, manufacture and install custom range hood vents in any dimensions or style you need! Our expert team of metalworking professionals will work with you to gather your project’s specific technical and design requirements and transform them into the range hood you or your client have always dreamed about. With over 20 years of metalworking experience and creating custom range ventilation solutions for commercial kitchen applications, we’ve decided to offer our custom vent-a-hood design solutions directly to the public. Now any residents from Austin to Waco who are within a 100 mile radius of Temple, TX can enjoy a unique kitchen accent which is both functional and eye-catching. One of our latest custom vent hood designs used a powder coating technique to mimic the look and feel of brass accents which, when combined with stainless steel construction, created a luxurious work of art the client is thrilled to display in their newly remodeled kitchen. Please enjoy the project gallery below which displays some of our recent range hood designs! We want to help you complete your kitchen remodel with a truly one of a kind range hood ventilation system, so please give us a call at 254-774-9099 to get started today!